Clark Gable and Shirley Temple loved Waikiki's resorts. Now those hotels are luring travelers who want serious food and gentle surf. If anyone ought to hate Waikiki, it's me. As a lifelong California surfer, I've traveled to the Hawaiian island of Oahu many times, but I've always skipped Honolulu and its beach district, Waikiki, in favor of the wild North Shore. I wasn't interested in Waikiki's shoreline crowded with high-rise apartments or its slow-rolling waves full of happy beginners. But maybe I've been missing out. CBS has been on location in Waikiki shooting a remake of the iconic 1960s TV series Hawaii Five-0. And several of the hotels that lured the Fords and the DuPonts to Waikiki in the early 20th century have just undergone multimillion-dollar makeovers to restore their retro glamour. Could Waikiki revive its 1920s glory days, when the legendary Duke Kahanamoku gave surfing demonstrations to crowds of thousands? I decided to find out. I also wanted to check out Waikiki's new restaurants. As someone who's been known to cure an entire foie gras for personal consumption, I'm as interested in eating as I am in surfing. In Waikiki, I'd do both. A pink-stucco palace built in 1927, the Royal Hawaiian has hosted famous guests ranging from Clark Gable and Franklin D. Roosevelt to the Shah of Iran. After I handed my rental-car keys to a blond surfer-boy valet, a bellhop draped a genuine orchid lei around my neck. (I had to stifle a laugh.) He took my bags and led me into the open-air reception hall with its Moorish arched doorways and framed sepia photos, then handed me a glass of pink, juice-spiked iced tea. Ceiling fans turned lazily overhead as happy-hour crowds filled the tiki-style Mai Tai Bar, mistakenly believed to be the birthplace of the Shirley Temple cocktail (Temple visited the Royal Hawaiian in the 1930s). I could see waiters preparing the great green lawn for the weekly dinner show. 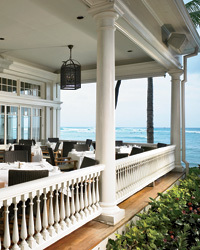 "We now call it the Aha Aina," said Scott Kawasaki, the hotel's prim, trim PR manager. "Basically, it's a luau. We just didn't want to call it a luau, because..."
"Say no more," I answered. If anything in Hawaii screams tourist kitsch, it's the word luau. After unpacking in my pink-and-silver roomthe $60 million retro-glam renovation meant celebrating various shades of pink, apparently I decided to skip the Aha Aina for Azure, the hotel's new seafood-centric restaurant. 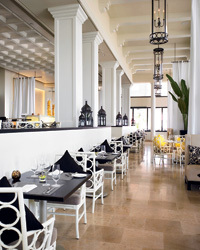 It's a bright and modern space, with patio cabanas and marble-topped tables flush against the beach sand, long white curtains waving against the baby-blue sea. At home I might braise pork belly for a weeknight dinnerI love rich foodbut I almost never crave such excess at the beach. So I was thrilled with chef Jon Matsubara's moi, a white-fleshed Pacific fish beloved by Hawaiians that's now successfully farmed. Matsubara hits the Honolulu Fish Auction many mornings, so the moi was amazingly fresh. He bones the fish, leaving both fillets attached to the head and tail, then fries it and uses it as a bowl to hold a lightly dressed watercress-and-tofu salad. The next morning, I headed to the beach to rent a 10-foot longboard, Duke Kahanamokustyle, from the Royal Hawaiian's genuine beach boys. The term beach boy originated in Waikiki, referring to the young Hawaiian men who took tourists out on outrigger canoes and taught them to surf. Both the term and the job survive to this day. Paddling straight out from the hotel, through an entire soccer team that was collectively learning to surf, I joined a friendly crowd at the world-famous break called Queens, the birthplace of modern surfing. At most serious breaks, only one person rides each waveyou get yelled at if you try to join inbut in Waikiki, every wave is a party wave. We all rode together, laughing and splashing. Just down the beach from the Royal Hawaiian, the Beaux Artsstyle Moana Surfrider was built in 1901 and got a $30 million overhaul in 2007. If the Royal Hawaiian's recurring motif is pink, the Moana Surfrider's is white, from the snowy bed linens to the painted plantation shutters. With sand still between my toes, I sat at an outdoor table on the Colonial-style white-columned veranda in the shade of a century-old banyan tree. At night, the hotel's Beachhouse restaurant becomes a steak house, complete with raw bar, Caesar salad and wagyu rib eye. But in the afternoon, the same space serves a proper British tea, including sparkling dry rosé, berries with crème fraîche and finger sandwiches; each guest gets a complimentary sandalwood fan. As I sat reading a newspaper, I somehow attracted the attention of a white-haired Canadian gentleman who wanted me to know that he and his wife come to the Moana Surfrider every year, drawn in part by what he called "the best afternoon tea in the Empire." I amiably agreed. The setting for the 1925 Charlie Chan novel The House Without a Key, the Halekulani Hotel has a new chef at its Orchids restaurant, Vikram Garg. Garg, formerly of the acclaimed IndeBleu in Washington, DC, is so besotted with Oahu's farmers that he just introduced the six-seat Table One inside Orchids as a showcase for his experiments with local produce. Diners must reserve at least 48 hours in advance to give Garg time to create an original menu. Chefs like Garg are part of a new farm-to-table movement that's taking advantage of Hawaii's rich volcanic soils. "In the '90s," says Janice Wald Henderson, author of The New Cuisine of Hawaii, "some farmers were growing pot, and the chefs were like, 'Hey, you've got this great soil, why don't you grow these cool onions and tomatoes?' " Now farmers are producing foods that go far beyond those staples. At the end of my six-course Table One mealwhich included cumin-spiced scallops in a sweet-and-tart orange-ginger sauce and an aromatic fenugreek lobsterGarg brought out two bowls. One held a dark, cherry-size fruit, the other a bright-purple orb about the size of an apple. Garg said that he had no idea what either one was called. Hawaiian farmers, he told me, come from so many different cultural backgrounds that it's hard to trace what they grow back to a country of origin. Then he cut open the big purple orb: the electric-violet-and-white flesh glistened like a ripe Hachiya persimmon, but it tasted cleaner and sweeter on the tongue. At a windowless dive bar called the V Lounge, located on a seedy street near the luxe Ala Moana shopping center, I found another chef who worships local ingredients: Alejandro Briceno, the former pastry chef at both Nobu Las Vegas and Nobu Waikiki. Using a pizza oven stoked with Hawaiian kiawe wood, Briceno turns out tender, smoke-charred crusts topped with local ingredients like mushrooms, arugula and his own handmade mozzarellathough he also knows when to import ingredients, like San Marzano tomatoes and prosciutto from Italy. I loved the Prima, topped with pancetta, egg and truffle oil. For something fun and a little bit kitschy, I decided to check out the new Honolulu Surfing Museum, which is inside the restaurant Jimmy Buffett's at the Beachcomber. The "Margaritaville" musician, an avid surfer, convinced a surf-memorabilia collector in California to move his world-class finds to Waikiki. I had a drink at the tiki-style bar then checked out some of the museum's more esoteric holdings, like the Yater Spoon surfboard from the movie Apocalypse Now. Daniel Duane is a contributing editor at Men's Journal. He is at work on a memoir about how cookbooks saved his life.